We woke up this morning to rain outside and a headache for Jan, so it was a good morning to lay around the rig. About 12:30 we drove over to our favorite Chinese buffet here in Elkhart, North Garden Buffet. Another of our top 5 Chinese restaurants. It was really good, Nick. Actually we ate at El Maguey yesterday and North Garden today just to annoy Nick, since they’re two of his favorite restaurants, and he’s not here yet. Later in the afternoon, we talked to Michelle from Phoenix Commercial Paint about doing some repainting on our coach. She’s going to come by tomorrow to take a close look at what we want done. We got this group wedding picture from our son-in-law Lowell. 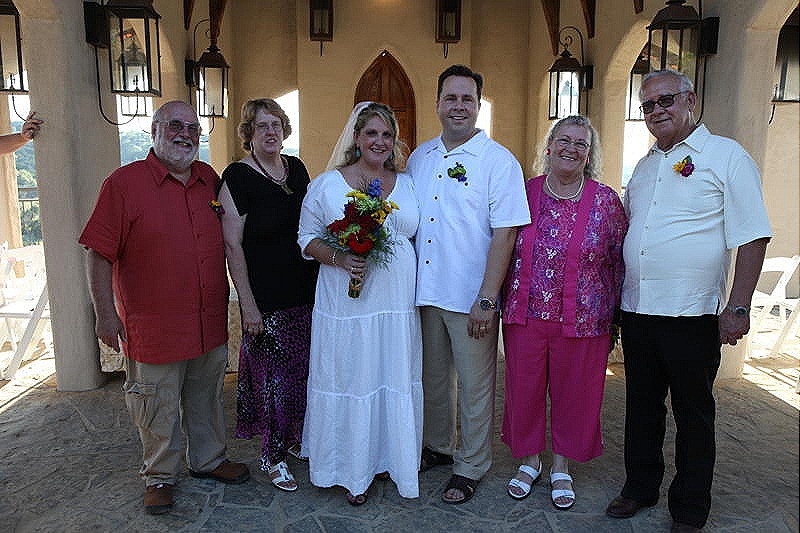 From left to right: Me, Jan, Brandi, Lowell, Lowell’s mother, Sonja, and Lowell’s father, Lendel. Thought I’d give you this repeat link from our stay in Celina, OH last year. They have a great 50’s style restaurant in nearby St. Mary’s that also houses a really good Elvis museum.